EMR is an all-in-one enterprise-ready big data platform that provides cluster, job, and data management services based on open-source ecosystems, such as Hadoop, Spark, Kafka, Flink, and Storm. 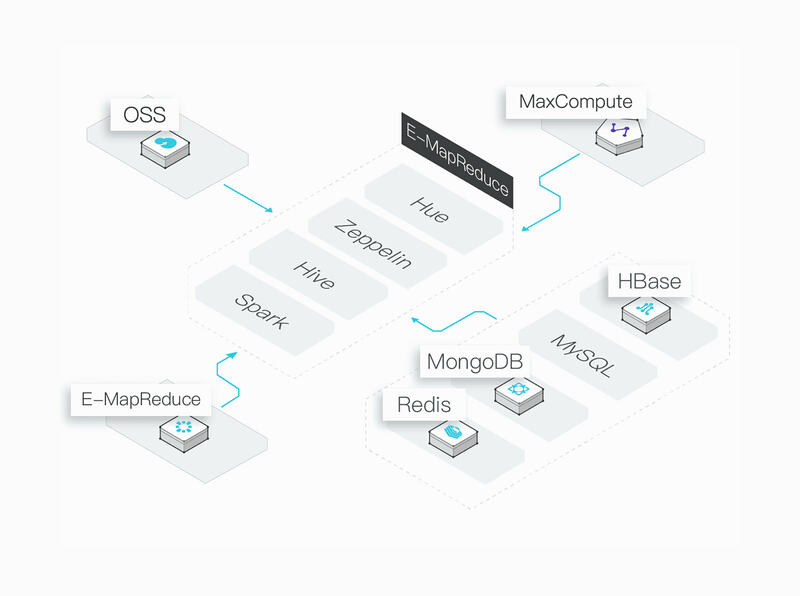 Alibaba Cloud Elastic MapReduce (EMR) is a big data processing solution that runs on the Alibaba Cloud platform. EMR is built on Alibaba Cloud ECS instances and is based on open-source Apache Hadoop and Apache Spark. EMR allows you to use the Hadoop and Spark ecosystem components, such as Apache Hive, Apache Kafka, Flink, Druid, and TensorFlow, to analyze and process data. You can use EMR to process data stored on different Alibaba Cloud data storage service, such as Object Storage Service (OSS), Log Service (SLS), and Relational Database Service (RDS). You can quickly create clusters without the need to configure hardware and software. All maintenance operations are completed on its Web interface. You can create clusters and dynamically scale in and out the number of compute nodes based on current computing needs. EMR provides a deeply optimized cluster environment, automated background maintenance, and multiple online support channels. EMR supports Kerberos authentication and data encryption. You can use RAM users to refine the management of service permissions. You can quickly deploy and expand clusters from a Web interface without the need to manage the hardware and software. You can quickly deploy multiple types of clusters, such as Hadoop, Kafka, Druid, and ZooKeeper. You can quickly add any types of nodes to the existing clusters. You can execute plans to create clusters, execute jobs at the scheduled time, and release clusters after job execution. You can add, configure, and maintain components based on your needs. You can scale in and out cluster compute resources at the specified time to reduce the total cost of ownership (TCO). EMR offers simple job orchestration and scheduling. EMR supports graphical job editing and management for you to execute and orchestrate multiple types of jobs. EMR supports job and dependency scheduling. You can orchestrate and schedule jobs as DAG-based workflows. You can use EMR to start a temporary cluster to execute jobs at the scheduled time and stop the cluster after job execution. When EMR fails to execute a job, it immediately sends an alarm. You can also set EMR to automatically re-execute the job. A big data processing platform with petabytes of storage capacity and compute capability. A memory-based new-generation distributed computing framework that supports offline and real-time computing, SQL syntax, and machine learning. An offline data processing system based on Hadoop. Hive supports structured table management based on Hadoop Distributed File System (HDFS) and provides query syntax that is similar to SQL for data analysis and processing. A high-throughput and reliable distributed message publication and subscription system. A real-time compute engine that supports real-time data processing within milliseconds. A distributed and open-source coordination service that can ensure the consistency of distributed applications. A management tool and Web interface. An open-source job scheduling tool. An open-source real-time big data analysis software. A distributed engine for batch processing and stream processing. EMR is deeply integrated with Alibaba Cloud services. You can use Object Storage Service (OSS) as HDFS in most of the EMR components. EMR provides an SDK which allows you to input real-time data (RTD) from Log Service (SLS). 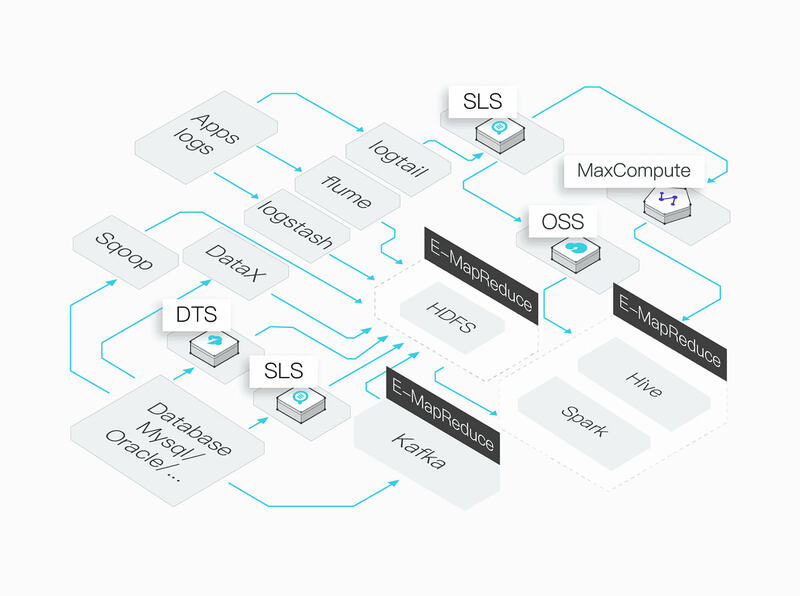 Hadoop carries a built-in ES-Hadoop plug-in which supports all Elasticsearch operations. EMR supports reading and writing Alibaba Cloud MaxCompute data. EMR supports reading and writing data from Alibaba Cloud message services, such as Message Queue and Message Service, and supports SDK integration. EMR offers multiple data integration methods. You can integrate open-source, offline, real-time, and Alibaba Cloud-developed data integration tools into EMR. EMR supports the real-time collection of logs and other text. EMR supports batch and real-time data collection from databases. EMR supports multiple compute engines, including Hive, Pig, Spark, SparkSQL, and Tez. It also allows you to access and use data stored on different storage services. EMR supports multiple compute engines, including MR, Hive, Pig, Spark, and Tez. EMR supports reading data from data sources such as OSS, HDFS, MaxCompute, and Kafka. EMR allows you to write compute results to various software in multiple formats. EMR supports flexible and fast data analysis. 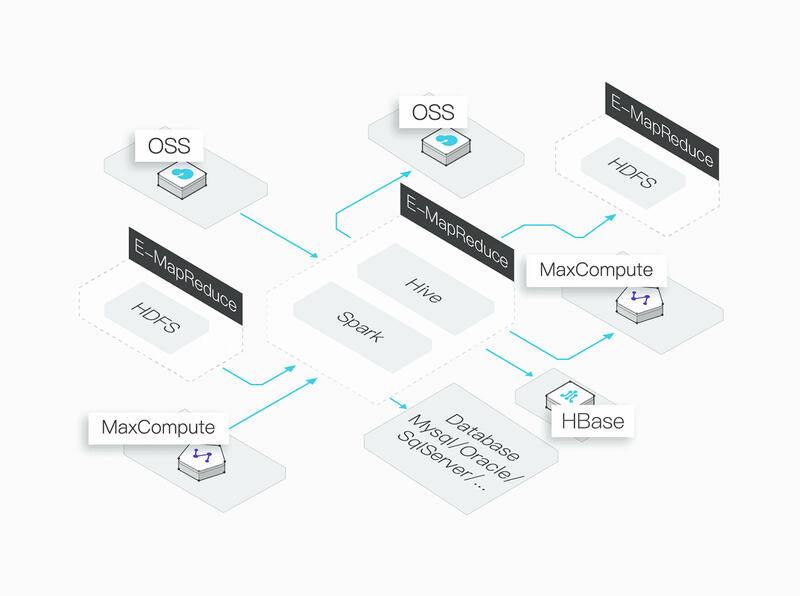 Based on the scalability of Alibaba Cloud, you can quickly create a Hadoop cluster to analyze data and release the cluster after the task is complete. You can use EMR to quickly build a temporary Hadoop cluster to analyze data and release the cluster after the task is complete. You can customize the number of compute nodes in clusters based the compute task needs. EMR provides flexible, reliable, and stable real-time computing. EMR supports multiple real-time data sources, all solutions in open-source communities, and Alibaba Cloud solutions. You can read data from system logs and the binary log. 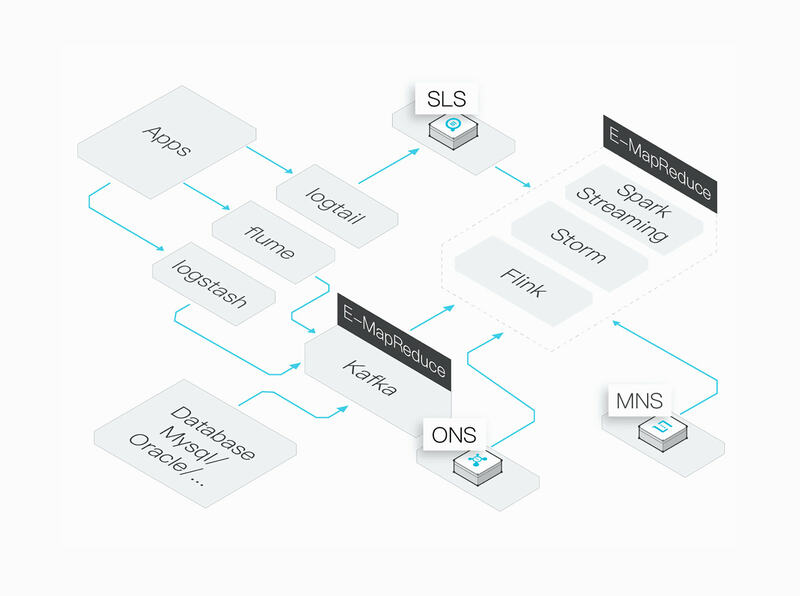 EMR supports Spark Streaming, Storm, and Flink.